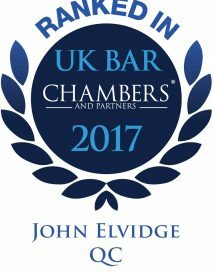 John Elvidge QC prosecutes and defends serious criminal cases. He also undertakes regulatory and licensing work. R v Black and others (Operation Adobe) (2018, defending a financial consultant) – five month trial; an SFO prosecution that concerned millions of pounds worth of sales of solar panels throughout the UK using incentive schemes based on prospective offshore investment and insurance. The case was stayed for abuse of process.